Wow! Love the lip color! So juicy! I don't know if I am brave enough for orange lashes but I do want to crack open my blue and green mascaras before summer ends! Such a summerish makeup indeed! Love your cheeks and lips! Ah, and not to forger - the mascara is outrageous! But I like it! And I think no one else can wear it better! I am a fan of different colour mascara's! My favourite is blue, black is boring! Have a great weekend, Lilli! Ma che bello il mascara arancione Lilli, mi piace un sacco! 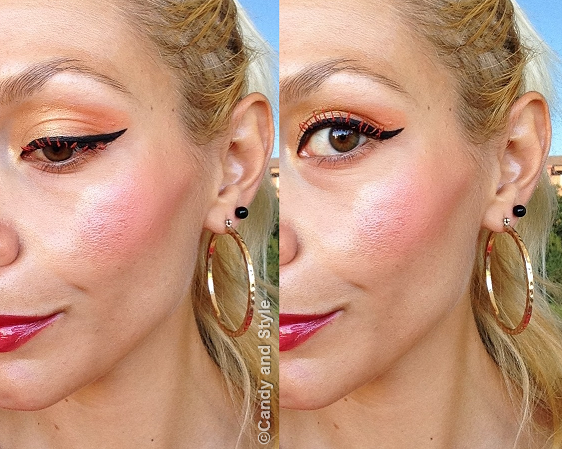 Mi piace anche l'eyeliner, l'hai applicato benissimo, e in genere adoro questo make-up dai toni caldi! Anche il rossetto ti sta benissimo! mi piace moltissimo il mascara arancione!! Your lips are gorgeous, Lilli! Ma sei bravissima con l'eyeliner, quanto mi piacerebbe metterlo così e che carino il mascara arancione! Buon week end cara! Stai veramente bene, bello il mascara colorato! Orange lashes sounded scary to me but you totally pull them off and make them look very pretty too Lilli! 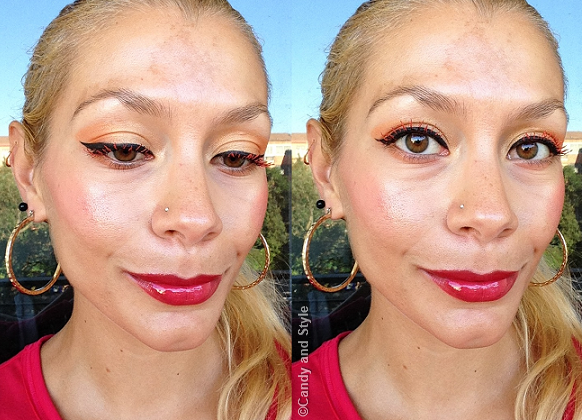 These vibrant shades are really summer perfect and the look you created is lovely. Have a splendid weekend my friend. Bellissima Lilli, adoro la mascara arancione! Un bacione tesoro. Orange lashes look so cool on your eyes. I have to try colorful lashes one day. Your skin is so so healthy and glowing. I love the orange lashes, perfect for summer! Have a wonderful moth dear and enjoy your weekend! Deear Lilli, it´s always a pleasure to see your make-up ideas. Red lips are always great and i love such a color for my lips also like you. Very inspiring is you eye-make-up. Is the eye-shadow a gold color? I´m sure i would have problem with the eyeliner, my hands are shaking to much. Your eyeliner looks perfect. Io vorrei capire come fai a truccarti cosi' bene da sola! Addirittura esiste il mascara arancione? Fighissimo! Voglio la linea dell'eyeliner come la tua! This is such a pretty makeup look. I love the colorful lashes! Your makeup is clean and fresh and the red lips is so edgy. All the best wishes for the new month. Wow! I haven't seen orange lashes before. You look cute even with orange! Very beautiful make up look as usually! Love your Summer make-up Lilli. Your lipstick and blush are just perfect for Summer. Have a wonderful Weekend! Non credo di esser capace a truccarmi così bene, hai una mano talmente precisa.... guarda quell'eye-liner!!!!!!!!!!! Il mascara arancio è una figata e mi piace moltissimo quel rossetto così lucido: bellissimissima!!!!!!! Aw wow, orage lashes!! I never knew that it could look so amazing, love the effect it has, it really brings out your beautiful eyes! You are an expert at makeup! Loved reading your viewpoint on my last point... Have a Fabulous Weekend! The orange eyelashes look interesting; I have never seen this before! Thanks for trying this for us. Fantastico questo makeup Lilli! Perfetto per l'estate! Lilli you are so fantastic, I liked your summer make up!!! wow amzing oragne lashes!!! I never thought any other color lashes apart from black would look this good. I love your eyes make up. Nice makeup. Fun with the orange mascara. You look fabulous dear - love the orange lashes and shadow. I just bought some purple mascara and it looks good against my green eyes. Very beautiful <3 Have a lovely Sunday, dear Lilli! Wow! So colorful and summerly! invece il mascara arancione non l'avevo mai visto, è fighissimo l'effetto! At first I thought I was seeing things. Then I thought you had false lashes on. After that I saw that they were mascara and I was like "OMG! That looks just like false lashes." So long and so uniformly applied. I like how they stand out against your black eyeliner. You're so daring to have orange lashes. Did you turn many heads and get many compliments? On your previous post, I'm also an Internet gal. I just need to have my Internet even when at the beach. I reckon that the only time I do not have my phone with me is when I'm in the water. You're so generous with your compliments, Lilli. I thought my Spain nails were bad. Hahaha... Those were cheap nail polish and they do not glide smoothly at all. They also took a me long time to dry that when I awoke the next day, I saw terrible bedsheet texture on them. Now I know that for nail polish, sometimes you really get what you've paid for. Hi Lilli, you look so sweet, loving your make up. Your eyeshadow color is perfect, I need to try it. How creative is this and it looks gorgeous on you. Haven't used coloured mascara since I was in high school but I kinda want to look for some now! A me piacciono molto i mascara colorati, in particolare prediligo il viola. Sempre bellissima! Ciao bellissima, buon inizio settimana!!!! This is such a brave makeup you did- I don't think I would be brave enough to rock an orange mascara! But the way you did, makes it look effortless and very natural! And I love the color of your lipstick! Ciao Lilli! Sei veramente molto brava (oltre che bellissima); questo make up è perfetto, soprattutto come hai messo l'eye-liner!!! Ma il mascara colorato è fighissimo!!1!!! !